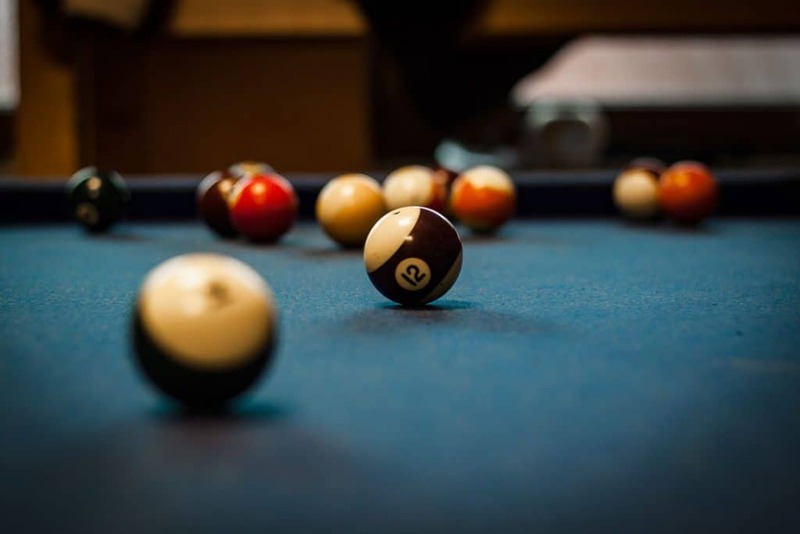 If you’ve never owned a pool table before, figuring out what to look for can be difficult or confusing. So here are some things to look for in your potential purchase so you can make sure you don’t end up with a bad table. Because saving money on a used table isn’t worth it if you don’t get a good table. Here’s what to look for when buying a used pool table. A flat and level surface is the most important part of the table. When you’re buying a new table, it is pretty safe to assume the surface is flat. But if you are looking at used tables, you need to be a little careful. First off, make sure the table has legs that are adjustable for leveling. Even if the table itself is perfect, your floor may not be. If you have a very new home, the floor may even settle and change over time. You can use things like playing cards slid under the table to make small adjustments. But that is difficult, imprecise, and just plain looks bad. A flat and level playing surface is the main concern when selecting a used pool table. So get a table that you can level. When looking at used tables, you want to make sure that the surface is flat and consistent. You want to make sure there are no depressions or inconsistencies in the surface material (typically slate). If there are inconsistencies, then no matter how level the base of the table is, you’ll always have inconsistent game play because of these areas. This can happen in older tables that have multi-piece surfaces that are not placed correctly or it can happen to tables with surfaces that are not slate. It can also be a result of aged or damaged felt, which is much easier to remedy than depressions in the table itself. 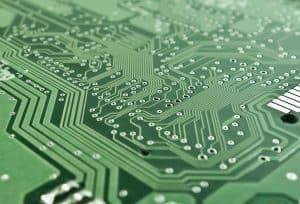 You need to find out what the issue is and how much it would cost to repair. Then you can either decide to look for a different table OR use that to negotiate the price down. When looking at a used pool table, bring a level to check various spots of the surface. Don’t check just one spot. I’d recommend a digital level, they are much more accurate, easier to use and let you write down the actual number values to compare to other tables. Remember you want consistency across the whole table, so a minor slope is ok if its the same in all spots of the table. That just means the entire table needs adjusting, which you would have to do anyway when you get it home. If you don’t have a level with you, at least gently roll the balls across different areas of the table to see if they turn in any direction. This is much less accurate but can be helpful in a pinch. 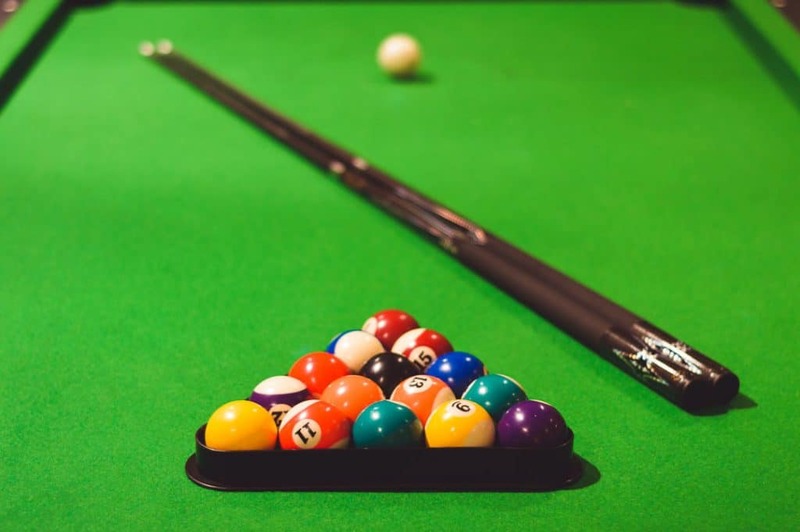 Just like with any pool table, when you are choosing a used pool table, you need to assess the overall build quality of the table. The best way to ensure quality is to choose a table with a proven brand name. Brands like Diamond Billiards, Brunswick, and Olhausen are strong indicators of quality construction and build quality. You should ask for the original receipt or bill of sale if it was purchased more recently. Look for a table that is made of solid hardwood. That will make it heavier and more durable. Look for a frame that has an “H” pattern and is at least one and a half inches thick. Good tables will have two thick support beams across the short length of the table and at least one down the middle of the long length of the table. The best tables even have two center beams in both directions. Also look at the corners. Cheaper made tables will have thin metal brackets supporting the corners while more well made tables will have solid wood blocks bracketing the corners. These are generally more stable during game play. It’s important to make sure the rails have good rebound. Replacing the rails of a pool table can be very expensive. The simplest, and sometimes the best, way to test the rails is to just roll a ball with some force against the rails and see if they rebound smoothly. If you need a frame of reference, go to a store that sells new tables and see how the ball rebounds on a display model. Rails should be crafted from hardwood which helps to minimize the vibrations and gives a truer bounce. 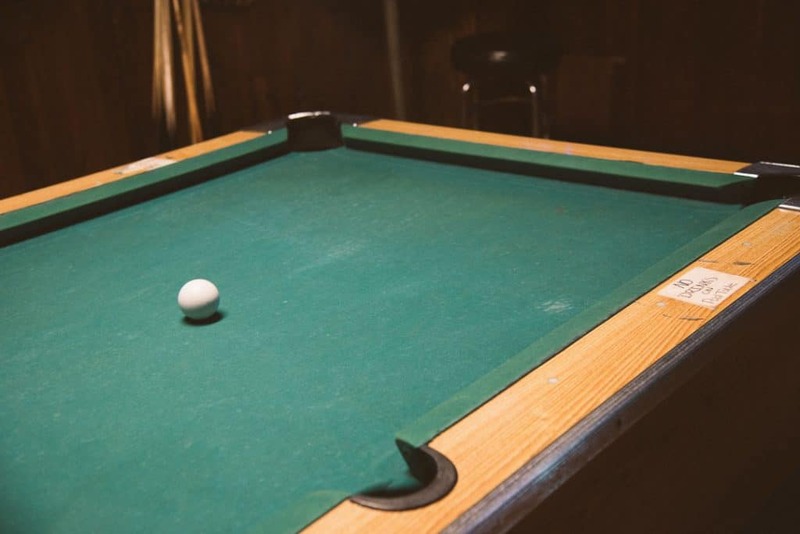 If you’re looking at a pool table and it doesn’t have slate…move on to another table. Don’t fall for the slate substitutes out there on the market. Things like Slatine, Slatex, or Honeycomb all have one thing in common, they are inferior to slate. Wood and other materials will warp over time and are much more susceptible to damage. The lack of slate also makes the table much lighter which can cause movement during play. If slate is out of your budget even for a used table, then save up some more. Buying a table without slate is more of a toy than a serious pool table. Look for slate that is backed with a minimum of 3/4 of an inch of supporting wood. The best slate will have a diamond-honed surface. If it comes as a three-piece slate, ask if it’s matched. A matched slate means that all pieces have been cut from one slab. Worn out felt is easy to identify and among the easier things to fix on an old pool table. It may cost a few hundred dollars though, so be sure to build that into your budget if you think it is necessary. The felt on a pool table is made of wool and nylon. Generally, speaking, a higher wool content means a more durable surface. Look for about 80/20 wool to nylon ratio. The best felt surface will be glued and then screwed into place. Light glue and staples will not provide a lasting surface. Ask about the wool content of the felt. The more wool in the material, the more durable it will be. Quality felt is usually 80 percent wool and 20 percent nylon. Look for pockets that re made of soft rubberized plastic or leather. Check for cracks in the plastic or tears in the leather. These are also easy to replace but vary in cost depending on the materials. For a good visual explanation of these parts of a pool table can be found in the video below. The video talks about new tables, but the same considerations hold true for used tables as well. Buying used means saving money, but you should make sure you are aware of all the potential extra expenses that come with buying a used table. Remember, new tables usually have a substantial warranty and include delivery and set up when you buy them, but when you buy a used table, those things come right out of your pocket. You need to hire a professional to move and/or reassemble the table. No table should ever just be lifted whole and transported (no matter how many people you have or how strong they are). I highly recommend hiring a professional for all phases of the transportation: disassembly, transportation, and reassembly/set up. However, if you want to save more money, it is possible to do the disassembly and transport yourself. Just make sure to mark each part to where it matches up. You can use a sharpie (for the spots that don’t show) and removable labels (for the parts that are visible. You should always hire a professional to set it up in your home though. That is the most critical part of the entire process. You also need to take into consideration any repairs that need to take place. You many need to get new felt, new pockets, or even have some woodwork done. I can’t possibly estimate how much these kinds of repairs can cost, so before making any used table purchase, check with your local retailer as to how much they charge for whatever you think you are going to need. 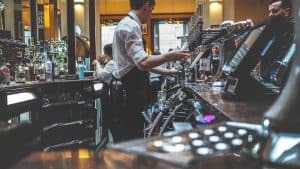 Unplanned expenses can sometimes make used tables much less of a deal than you initially thought. So keep that in mind and don’t be afraid to use your new knowledge to negotiate a lower price or just walk away altogether. I hope this has helped you find the pool table of your dreams and do so at a reasonable price. A quality pool table can out last most of us and become a prized family heirloom, so take good care of it and, of course, enjoy it. 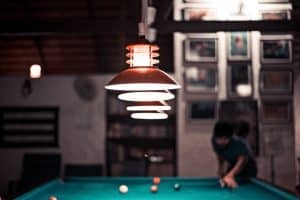 If you have had experience purchasing a used pool table, leave a comment about your experience and what you learned from the process.